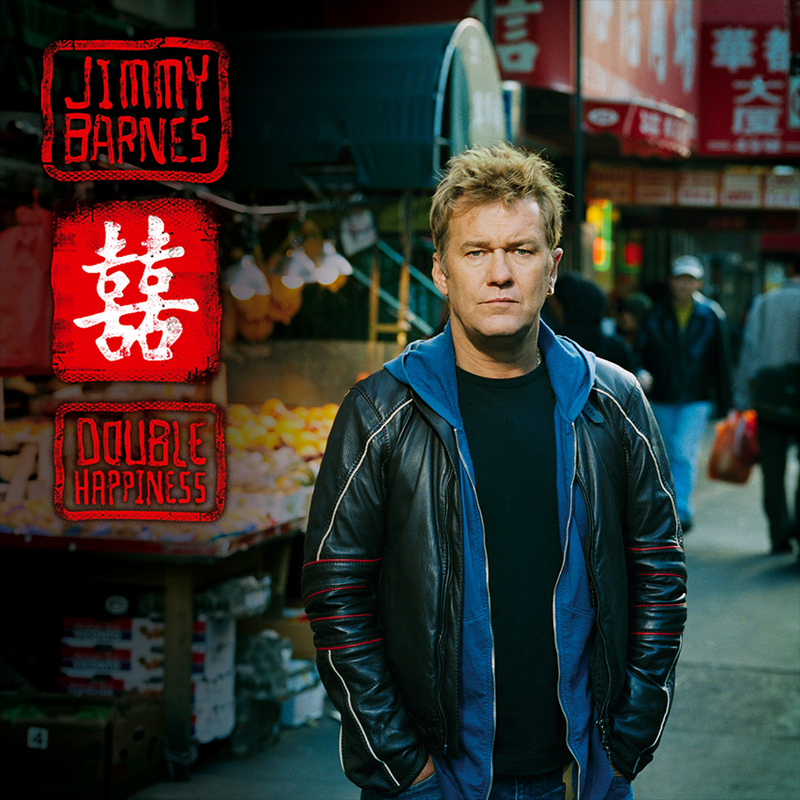 Jimmy Barnes’ new album is called DOUBLE HAPPINESS and and is the most-anticipated Barnes album since his solo debut, BODYSWERVE in 1984. The first release is a limited edition two-CD set featuring duets with: DALLAS CRANE – THE LIVING END – DIESEL – INXS – MICA PARIS – TINA TURNER – JOE COCKER – MAHALIA BARNES – TINA HARROD – ROACHFORD – EJ BARNES – RAHSAAN PATTERSON – JOHN SWAN – ELLY-MAY BARNES – JUANITA TIPPINS GARY PINTO – JOHN FARNHAM – JACKIE BARNES – THE BADLOVES – TROY CASSAR-DALEY – SMOKY DAWSON – TIM ROGERS – BILLY THORPE – DAVID CAMPBELL. On DOUBLE HAPPINESS Jimmy Barnes has found a new, evolving sound … building on the foundation of his rock ‘n’ roll heritage, he’s added a strong female element to the tunes, a lot of acoustic, down-to-earth sounds and a deep seam of soul music through the whole record. Jimmy Barnes is Australia’s most successful and enduring male singer. He was the lead singer in legendary rock band Cold Chisel and then started a solo career that has touched on the bases of southern soul, hard rock and country rock at different times. Planning for the DOUBLE HAPPINESS album started more than a year ago. “About a year and a half back I agreed to release all of my back catalogue through Michael Gudinski and Warren Costello’s new label, Liberation. We met at Michael’s house one Sunday afternoon to start planning for the next record and we all agreed that it would be great to build a bridge between my past, of which I am very proud, and my future which is even more important to me. So we started to record a bunch of new tracks and then every time we thought we had the record finished I’d think of someone else I’d like to sing with”. So the album grew organically, mostly in Jimmy’s home studio in the southern suburbs of Sydney. Friends came by for afternoon tea and were suddenly collaborating on a new song. Over the course of a year the album took a shape that is pretty close to a portrait of Jimmy Barnes. There’s screaming rock ‘n’ roll and acoustic ballads. There’s country and soul music. Some things familiar, but mostly things brand new. “There are a lot of common threads in it” says Jimmy. “First off is working with quality singers, people I admire and really have respect for. “The other common thread is Mark Lizotte aka Diesel. He wrote a lot of the stuff, he produced quite a few of the tracks and he’s been heavily involved all through the album. The other great thing that ties it together is that it’s a real labour of love. And even beyond working with singers from all over the world that I respect and adore, I have also had an amazing opportunity to record songs with all of my kids. There’s a natural understanding between us. “The first singing I ever did was when I was a kid singing harmonies and duets with my brother Swanee back in Elizabeth when I was 7 or 8 years old. If the album started anywhere it was right there, me sitting with my jaw dropped listening to my brother and not thinking beyond wanting to be a singer like him. Everything that has brought me to this point you will hear on this record, he says. You can experience the acoustic records, the Soul Deep sound, the hard rock of Cold Chisel… you can hear me as a 13 year-old listening to Deep Purple. “These are all the elements that make up what I do”.